Will the Nation of Islam Disappear? The historic role of the Nation of Islam was to introduce African-Americans to Islam; that role accomplished, I already predicted in 2000, in "How Elijah Muhammad Won," that it will go out of business before long in favor of normative Islam (the sort that comes out of Arabia). As long ago as 1962, the author of a book-length study of the NoI noted that few who joined the Nation remained in it for very long. If that was true almost 40 years ago, it is even more true today. As blacks discover when they join and inevitably come into closer contact with the real thing, the NoI, whatever its claims to legitimacy, purveys a jumble of primitive and unsustainable myths with no connection to standard Islam. A folk religion founded in Detroit in the 1930's can hardly stand up to a religion with nearly fourteen centuries of history, nearly a billion adherents, 50 national governments to its name, and one of the world's great civilizations. 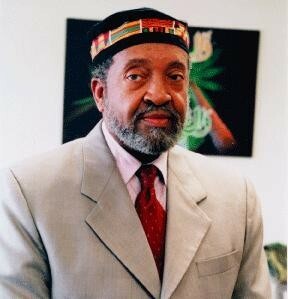 W. Deen Mohammed, son of Elijah Muhammad and American Muslim leader. A number of other factors tend toward the NoI's eventual demise as well. Each of its many splinter groups, including Farrakhan's, is centered around a dominant figure and amounts to "little more," as [Elijah Muhammad biographer Karl] Evanzz says, "than a cult of personality." When these aging leaders are gone, he continues, "all that will remain is a storefront temple here and there." Also relevant is the NoI's emphasis on hard work, thrift, and the family: this emphasis inculcates exactly the sort of habits that permit NoI members to escape poverty, but as they rise economically, they often seek a less sectarian faith. Some return to Christianity; more move on to standard Islam. is starting to shed its intolerance and align with orthodox Muslims. "The time for those leaders who had that hate rhetoric has come and passed and they know it," Mohammed told reporters after a question-and-answer session with the audience. … "I think there's a merger coming," Mohammed said, noting that student ministers in the Nation of Islam have been studying with orthodox Muslims. "A quiet merging of leaders of the Nation of Islam and leaders in my community." Dec. 10, 2013 update: Guess who's put the Nation of Islam on life support? The U.S. taxpayer. A report, "Farm Subsidies and the Big Dogs," based on data released by the U.S. Department of Agriculture and information via the Freedom of Information Act, issued by the watchdog group, Open the Books, finds that $103,529 in 19 payments was paid in farm subsidies to an NOI charity arm, the Three Year Economic Savings Program, in 2008-11. The NOI website indicates that this program purchased the Muhammad Farms in Georgia. The site also announces: "In 1995 we planted and harvested 76.3 acres of land, including watermelons, cantaloupes, sweet corn, snap beans, okra, yellow squash, zucchini, butternut squash, peas and greens." "America's Chickens are Coming Home to Roost"